Exploring the natural world around me. 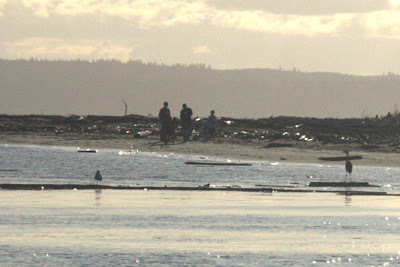 Thanksgiving vacation was spent on Whidbey island. The weather was lovely on Friday, so we went on a drive and ended up taking a walk on one of the beaches there (I think adjacent to Cultus bay). It was a protected little bay and there were large slow eddies out in the water; logs and other debris floating in lazy circuits. There were several great blue herons out there. My favorite was the one hitching a ride on a log out in the bay. 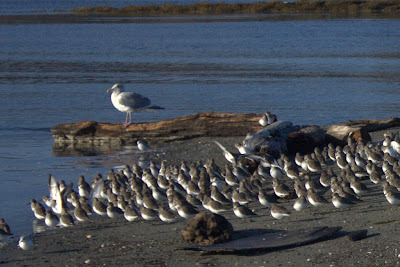 There were also a lot of shore birds flocked up out at the point. Many of them were just standing there, but at the edges they seemed more active. I saw an individual of the smallest shore bird species hopping around on one-leg. I wondered how it managed to survive one-legged long enough to get good at it. After observing for awhile longer I noticed that there was more than one doing that, and then I saw one of them put down a second leg and pull the other up. I guess they don't mind hopping around on one leg while keeping the other warm. I moved to the Seattle area in 2005 to attend the Anake program at Wilderness Awareness School where I learned such skills as friction fires, plant identification/usage, animal tracking, and more. Until recently I was working near Kirkland as a community college math instructor. Now I am working on some data/machine learning projects and looking to get back into the software industry.